The majority of electronic information relies on text and images to convey information. In most cases, an accessible version of these documents can and should be created. However, there are certain types of materials, like textbooks, that cannot be made accessible using conventional accessibility techniques. In those cases, the ACT Center provides Alternative Format Consultations as an accommodation (through the Disability Center) for students with print-related disabilities. We convert printed materials (such as textbooks, articles, or notes) into accessible, electronic formats so they can be used with various types of technology, including assistive technology. The fact that we provide this accommodation does not relieve faculty and staff of their responsibility to make their own materials accessible. We encourage everyone to learn about and incorporate the principles of Universal Design when creating course materials or web content. The basic principle of Universal Design is that what works well for a wide variety of people with various functional abilities works better for everyone. In other words, try to make your materials accessible to the broadest range of users, regardless of age or ability. 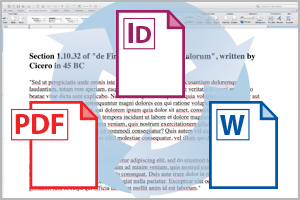 Make your Microsoft Word documents accessible. Make your Microsoft PowerPoint presentations accessible. Make your Microsoft Excel spreadsheets accessible. Use Adobe InDesign and Acrobat Professional to create accessible PDFs. Explore standard and widescreen University of Missouri PowerPoint templates designed with room for the captions at bottom of the slides for accessible presentations. Note that, although automated checkers are not foolproof and cannot check for every aspect of document accessibility (such as color contrast), they are still an important part of creating accessible materials. For more details on how to get started with screen reader and color contrast testing, go to our Test Your Site page.